I started this portrait working outside at my easel next to my art stall at Kings Heath Street Fair in Birmingham. Ozzy Osbourne …. From my early teens, the unmistakable voice of Black Sabbath. I feel I was so lucky to have experienced this amazing sound first time around. It seems now that although there is brilliant music being created and produced, listening to Sabbath for the first time was a life changing experience. I’ve followed Ozzy’s music through Black Sabbath and then his solo career and back to The Sabs again and seen many memorable live concerts. To me, a real showman, character and artist. 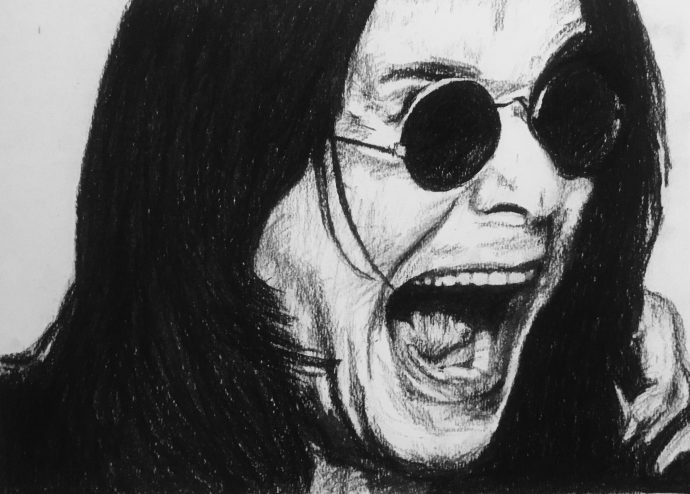 While I was sketching the portrait at the street fair a twenty something man saw me sketching and asked why I was drawing Ozzy Osbourne…”He’s just that fella who’s married to Sharon and did that MTV programme in his house, waste of time”…. I was about to react, but the fella had gone before I had time to respond. Anyway, here is my charcoal portrait, drawn by me with great passion for the legendary Mr Osbourne.